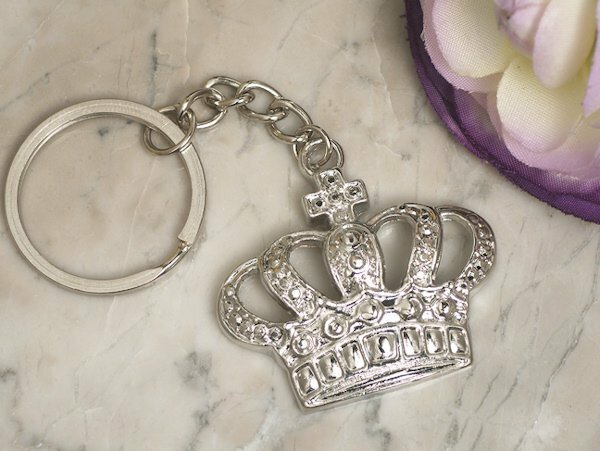 Treat your guests to the royal treatment with our Silver Royal Crown Keychain Favors. The perfect addition to your fairy tail event, an ornate silver chrome crown charm is attached to a metal key ring holder. Each favor is packaged in a black gift box finished with a white organza ribbon. Favor measures approximately 3" in total length. Do these crown keychains come separately packed in boxes with bows already tied? Is there a place to to put a personalized sticker? I'm sorry the Silver Royal Crown Keychain Favor can't be personalized but we sell personalized tags or labels here. The Silver Royal Crown Keychain Favor is an ornate silver chrome crown charm that is attached to a metal key ring holder. The crown for the Silver Royal Crown Keychain Favors are metal.